We partially identify population treatment effects in observational data under sample selection, without the benefit of random treatment assignment. 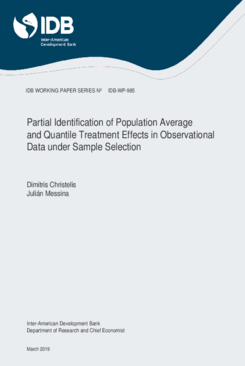 We provide bounds both for the average and the quantile population treatment effects, combining assumptions for the selected and the non-selected subsamples. We show how different assumptions help narrow identification regions, and illustrate our methods by partially identifying the effect of maternal education on the 2015 PISA math test scores in Brazil. We find that while sample selection increases considerably the uncertainty around the effect of maternal education, it is still possible to calculate informative identification regions.